Russian tumbler pigeons are originally from Germany, with possible ancestors dating back to Scandinavia in the 1700s. Russian tumbler pigeons are easily identified by their feet muffs, or feathers, which enable them to tumble while flying. These unique birds are prized by breeders and those interested in genetics, as they come in a variety of colors and patterns. Some Russian tumbler pigeons do not have any markings. Instead, they have one solid body color. 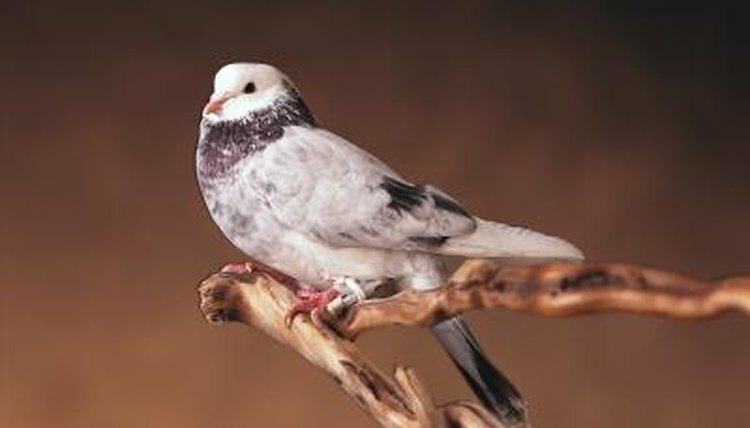 The National Russian Tumbler Club lists standards for body colors of these birds, which include khaki, black, brown, dun (dull gray), red, yellow, white and lavender. In addition to solid colors, many Russian tumbler pigeons have colorful body markings on their face, wings, neck, feet muffs, tail and belly. Some birds have markings only in certain places on their body, while others have combinations of colors in different spots. Colors of these markings include white, black, gray, purple, green, silver, tan, blue, brown and yellow. Unique patterns of these birds include grizzle (a mixture of dark and light colors), baldhead (white markings on the head) and mottle (irregular patches of color).